The recent Los Angeles Times photos depicting members of the 82nd Airborne Division posing with the bloodied remains of three suicide bombers while deployed in Afghanistan is yet one more unfortunate incident that has cast America’s finest military professionals in a less than desirable limelight (Associated Press, 2012). The piss poor judgment of the few should not be a reflection of the whole. Thankfully, I believe the majority of Americans know and understand this when it comes to those that serve our nation’s armed forces. Our “ally”, Afghanistan president Hamid Karzai, seized the opportunity to yet again slam the American and U.N. presence in his country. Mr. Karzai described this latest incident as “a disgusting act to take photos with body parts and then share it with others” (Associated Press, 2012). Mr. Karzai called for “an accelerated and full transition of security responsibilities to Afghan forces” and suggested the only way to prevent incidents like these is to end foreign troop presence in his country (CNN Wire Staff, 2012). Ironically, I couldn’t agree more with Mr. Karzai. The latest incident is rather disgusting. It’s difficult to understand why anyone would want to pose with dead bodies and body parts. Like many decisions that others cannot understand, I’m sure this decision made sense to someone at the time. Time itself will also tell us why the decision was made at all. I also agree with Mr. Karzai that it is time to end the foreign troop presence in his country. However, my rationale is more than likely different from that of Mr. Karzai. Mr. Karzai blames foreign troops for the atrocities that occur in his country. The reality is the Afghani people have been committing similar, and often more hideous, atrocities on each other for centuries. Transferring security responsibilities and removing foreign troops isn’t going to prevent the likelihood that incidents like this will continue to occur in the future. However, the men and women of the U.S. armed forces cannot continue to shed their blood and lives for a country that chooses not to take care of its own people. We cannot continue to try and help those that have no desire to help themselves. What’s ultimately disgusting here however is the hypocritical Mr. Karzai himself. The man that challenges the Western presence in Afghanistan is the man that benefits most from it. It is the presence of foreign forces that ensures his presidency and maintains his government. More importantly, it is Western money that enables him to live lavishly at the expense of his people. 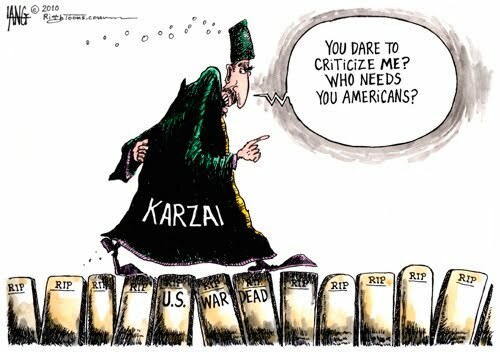 Despite all of this, I agree with Mr. Karzai. It’s time to end the foreign troop presence in Afghanistan. We’ll take our people, and our toys, and we’ll go home. Oh by the way, we’ll take our money with us too. As a nation, we’ll be better off by doing so. 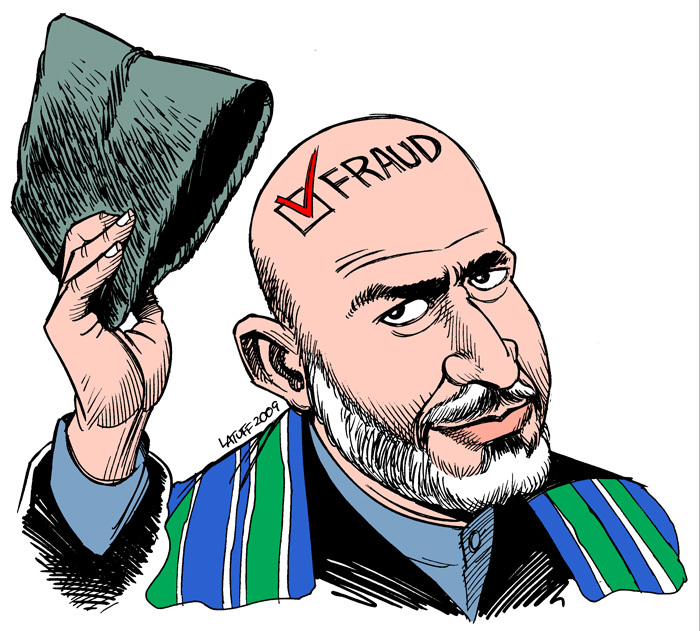 I’m fairly certain when we do however, Mr. Karzai’s fate will not be as promising as ours.